The last weekend of May has by now become synonymous with the two events Vignaioli di Radda and Radda nel bicchiere in Radda. This year, it was the second edition of Vignaioli di Radda and the 23rd edition of Radda nel bicchiere. One more recently founded and one well-established event, both strengthening the role of wine producers and wine in Radda. What is so special about Radda then? Well, it is a wine area located on high altitude with vineyards up to around 700 m.a.s.l. This used to make it difficult to produce wine in this area but the recent climate change with higher temperatures and a better exposition to sun has changed all that. The elegance and freshness of wines produced in the Radda area are now on everybody’s lips. On Friday, May 25th, the second edition of this event took place with a fun program for the invited press and other professionals in the wine sector. The vignaioli had organized an off-road tour of the vineyards in jeeps. Each jeep had its specific itinerary to cover the different zones of Radda. One of the jeeps, of course, also passed by the vineyards of Fattoria di Montemaggio. In the late afternoon, when the invited guests got back from the offroading, Valentina Canuti, a researcher at the University of Florence held the seminar “California in Chianti”. Valentina is part of a project with the University of Davis in California carrying out research on Sangiovese. It is not only the most cultivated grape in Italy but also in California with more than 1000 hectares of Sangiovese planted and around 100 producers making wine with Sangiovese grapes. In her research, Valentina Canuti has analyzed 62 samples of Sangiovese from California (32), Tuscany (28), and Umbria (2) in order to trace common typical traits and authenticate key chemical resources. From this she has created a model to use also for further analysis and research. 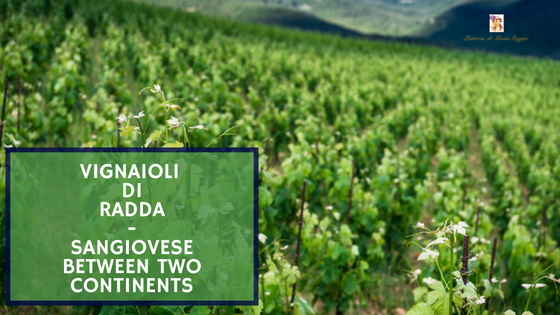 The result so far is that there are more similarities than differences between the Sangiovese in California and the one in Tuscany. Historically, it seems that most of the Sangiovese plants were brought over by the emigrants in the late 19th and early 20th century. More recently, the success of Sangiovese in the US, mainly California in this case, is due to Americans having studied the winemaking processes in Italy to mirror it at home. Following the seminar, it was possible to taste three wines from California together with the wines from the Radda producers. The day continued with several hours of tastings followed by a dinner in the cloister at the House of Chianti Classico in Radda. Fattoria di Montaggio was there represented by Ilaria and Edoardo who were presenting the Chianti Classico Annata 2013 and the Chianti Classico Riserva 2011. On 26-27 May, Radda nel bicchiere was held in the center of Radda in Chianti. The Saturday started in the morning with a seminar about Extreme Characters that was held by Fabio Pracchia who is the editor of the Slow Wine Guide. a Sangiovese in evolution where the perfumes and the flavors reach a balance. Overall, Radda nel bicchiere was a success this year with 29 Radda wineries that participated in the event and 4000 visitors during the weekend. This is a unique opportunity every year to enjoy the picturesque setting in the center of Radda while tasting wines and chatting with the various Radda producers.